As the red port lighthouse had turned darkly-discolored, it was hard to be found out. 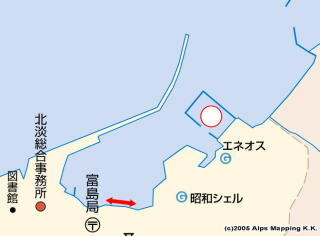 When I followed my original planned route (which is a red line on attached Google Map), there were wide fishing nets before the lighthouse. Then, I had to turn around widely to the east, closer to the shore, to keep out of the nets and to head to the red lighthouse. Passing by the red lighthouse to your right, move into the port further. Then, you will see a tiger-striped quay to your left after a landing place. Moor at an open space and ask a fisherman if any fishing boat comes back to your place. A guy at another port told me another berth. After passing by the red lighthouse to your right, turn left immediately. 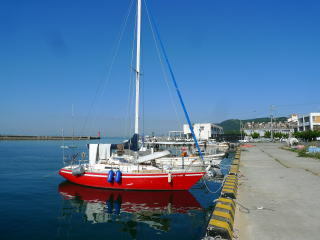 Then, there is a boat pool, which is the calmest place and a good berth for a sailing boat. You will not need to ask Gyokyo: Fisheries Cooperative Association. As there is no shop around, the port is not convenient for living. But, there is a public bathhouse. It is a good port and berth with pleasant feeling of relaxation. Toilet with a western style is at a beautiful park behind the tiger-striped quay. Water is at the toilet. There is only one shop “Sowa Food” for provisions. A liquor shop is a bit far ahead. I looked up and found a ship-shaped building of “Kanpo no Yado” bathhouse. It has an Onsen (spa) for JPY600 with a nice view. I relaxed there.